The USA has emerged from World War 2 as the leader of the West against the Communist East. 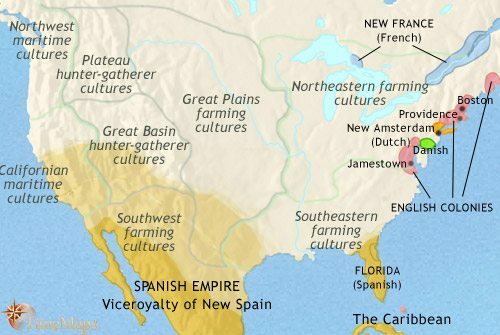 A group of European - mostly English - colonies have sprung up along the eastern seaboard of the present-day USA. 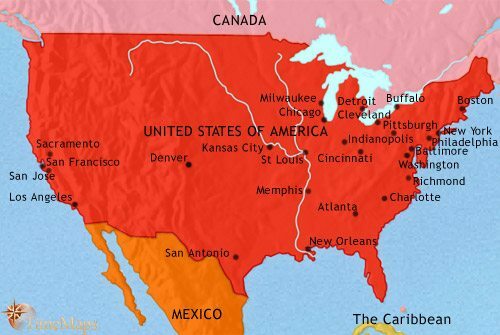 After the American War of Independence, the USA has established as a new nation. The land area of the USA has been vastly extended by the Louisiana Purchase. The USA has experienced the bloody American Civil War. The USA has experienced unparalleled industrial expansion. The USA is now the only superpower in the world. The USA played an important part in winning World War 1. After the war had finished, however, the country adopted an isolationist stance towards the rest of the world. It even refused to joint the new League of Nations, thus undermining that organization’s aim of maintaining peace in the world. At home, the 1920s were years of prosperity, technological advance and continued industrial expansion. These years also saw Prohibition, organized crime and corruption scandals at high levels. The Wall Street Crash of 1929 ushered in the Great Depression. President Franklin Roosevelt’s New Deal aimed at relieving poverty, but recovery only really came with the coming of World War 2 (1941-5). The USA played a pivotal role in defeating the Axis powers. In the post-war years the USA, took on the role of one of the two great superpowers of the world. It was a founder member of the United Nations (UN), and has led the Western nations in the Cold War, meeting the challenge of global communism. The final two states, Alaska and Hawaii, are added to the Union in 1959. 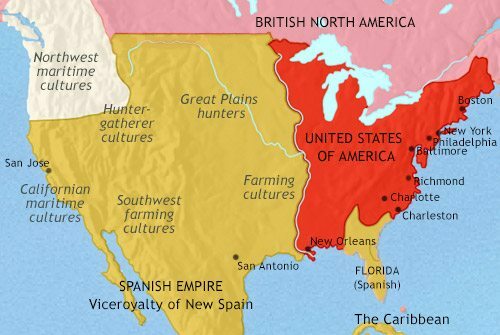 After one or two false starts, the eastern seaboard of the present-day United States began to be settled by European colonists from the early 1600s. Eight colonies have now been founded, six of which are English: Virginia (by a company owned by English courtiers and merchants, 1607), Massachusetts (by Purtians seeking freedom to practice their faith, 1620), New Hampshire (by a group of fishermen, 1623; New Hampshire is temporarily controlled by Massachussetts at the moment), Maryland (as a place where Catholics could practice their faith, 1634), Connecticut (an offshoot of Massachusetts, 1635) and Rhode Island (another offshoot of Massachusetts, 1636). There was also one Dutch colony (New Netherlands, founded by Dutch merchants, 1624) and one Swedish (Delaware, 1638, as a trading post). Each colony is governed according to its own principles and under its own laws. The population is increasing rapidly, with most of the “English” colonists coming not only from England, but also from Scotland, Ireland and Germany. The full compliment of 13 colonies was attained with the founding of New Jersey (by private endeavour, 1660), Pennsylvania (where Quakers and others could enjoy religious freedom, 1682), the Carolinas (as a royal grant to various English noblemen, 1663; later divided into North and South Carolina, 1712), and Georgia (by the British crown as a buffer against Spanish aggression, 1733). The British also took over New York and Delaware from the Dutch (1664 – Delaware had initially been Swedish). The strategic position of the British colonies was transformed with the elimination of the powerful French threat in the French Indian War (Seven Years’ War) of 1754-63. Ironically, this served to increase friction between the colonists and Britain, the mother-country, which tried to make the colonists contribute more towards the costs of their defence (via, most famously, the Stamp Act of 1765). The resulting protests led in a straight line to the Boston Tea Party of 1773, the American War of Independence (1775-83) and the founding of the United States (1781). In this year, 1789, the USA ratifies its Constitution, enshrining democracy as the ruling principle for the new country. In the same year George Washington was elected as its first president. The dominating theme of these years has been the westward expansion of the USA, aided by the acquisition from France of vast new lands in the “Louisiana Purchase” of 1804 and the strong, steady migration of settlers into these regions. Land hunger from whites has led to the Federal Government starting to remove Native American peoples to west of the Mississippi (from 1830). This period has also seen the early stages of industrialization, and a transportation revolution with the construction of thousands of miles of turnpikes, canals and railroads. Most notably, the completion of the Erie Canal in 1825 makes a massive contribution to opening up the interior. The southern states have developed a distinctive economic and social structure, based on the institution of black slavery and the growing of cotton on large plantations. This is causing rising tensions with the much more egalitarian, non-slave states in the north. The USA has continued to acquire vast new territories, by war and purchase, taking the nation right to the Pacific. The construction of the railroads plays a vital part in this expansion (the transcontinental line is opened in 1869). By 1850, most Native Americans have been relocated west of Mississippi, and as whites encroach across the great river into Indian lands, the conflicts continue, with the US army constantly on alert and in action. After the 1830s, tensions between the “slave” states in the south and “free” states in the north caused political compromise to break down, and led eventually to a bitter Civil War (1861-5) which convulsed the nation. The North’s greater wealth and manpower leads to victory and an end to slavery. At the moment of victory president Abraham Lincoln was assassinated, depriving the country of his leadership in the difficult aftermath of the war. For the south, defeat in the Civil War has been followed by a period of reconstruction largely imposed by the North, which will leave lasting resentments. The southern states have little share in the dramatic economic expansion which the rest of the country is now experiencing. This period has seen unprecedented industrial expansion. The demand for labour has sucked in millions of new immigrants, and new cities have arisen, and older ones expanding out of all recognition. Railroad, telegraph and telephone networks now cross the country. An important effect of the railroad is to properly settle the Mid-West, hitherto little more than a staging post to the west coast (where the discovery of gold led to a massive influx of migrants from the late 1840s). Native Americans have continued to be dispossessed of their land, gradually being confined to reservations. The USA has now acquired an overseas empire. As a result of a short war with Spain (1898), she gained Puerto Rico, the Philippines and a controlling interest in Cuba. Hawaii has also been annexed (1898). The US now has huge influence in Central America, and in 1914, the Panama Canal is opened, with the US controlling the Canal Zone through which it has been cut. The 1960’s and 70’s saw the assassination of President Kennedy (1963), the Civil Rights movement and the assassination of Martin Luther King (1968), the Vietnam War (1965-73), the sending of a man to the moon (1969 – one of the most astonishing feats in world history), and the Watergate Scandal (1974). In the 1980’s, President Ronald Reagan escalated the arms race with the Soviet Union, which led directly to the fall of the Soviet Union and the end of the Cold War. The US was left as the world’s only superpower. Since the attacks on the Twin Towers in New York on September 11th 2001, the US has had to realign its foreign policy and defensive stance to meet new threats. As a result, she has found herself at war in distant Afghanistan and Iraq.